I've been hoping this would change, forecasts are almost always wrong ... right? I can live with +7C - that's actually a great running temperature. 5mm of rain, though? Not so great. But worst of all is the 30km/h winds out of the east... gusting to 50km/h. 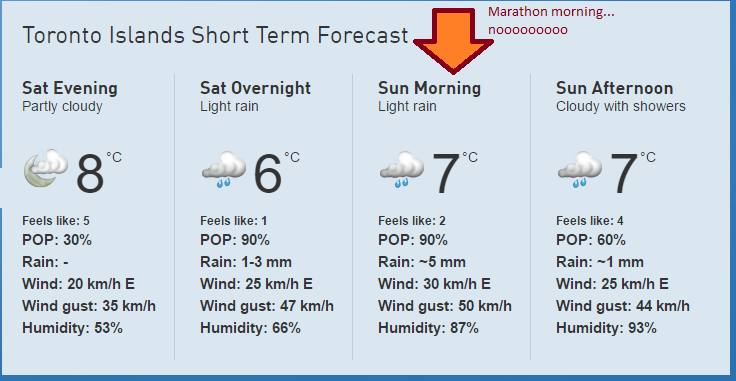 A headwind is never fun, but a headwind for the last 7km of a marathon is going to be hell. Although the tailwind going west will be interesting... we'll actually have a tailwind longer than a headwind! Between the downhill and the tailwind, I am thinking "banking time" might not be the horrible idea it normally is... an even effort throughout the race would have a pretty serious positive split right up to 35km of this one. My revised plan. Am I overthinking this? YES. Yes I am. Based on my calculation... that's a 3:38:03 and a PB! Yay! We'll see, though... putting things on paper is always easier than executing them on race day! Great plan. My PB is here 2014 and there was brutal west wind. You are right, tomorrow's east wind is better. It sounds ridiculous but that year I was forming drafting groups. I would pull in behind runners just ahead and tell them I was tailgating and we'd swap spots. Had a few groups up to 5 or 6 of us. All got the idea, they were struggling too. Pace sounds right. You'll get 2 minutes versus flat in first half if 1 second per m of elevation drop. Then who knows with more tail than headwind? But same here - I am pacing toward 3:26:00 early to get 3:29:00. 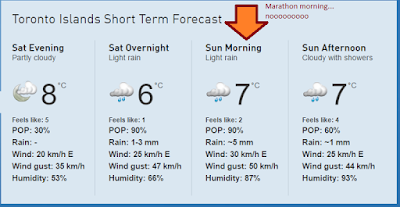 But unless you've bonked, you can stay ahead of long run pace 36-42K you know PB is at stake. Sure hope so! Good luck tomorrow, I'll keep an eye out for ya. Oh and my toe is better, I'll be there.